I was recently sent a copy of Elmo's Rainbow and Other Springtime Stories. As soon as Ana saw the DVD cover there was no way we were going to hold off watching it. The girl loves everything about DVDs (the boxes, the disks, opening and closing the DVD player) and when you add in the bright and shiny Elmo picture she was immediately hooked. It just could be the most cheerful Elmo DVD box ever. The DVD includes 3 short stories. In the first story Elmo and Rosita learn all about rainbows. The second story shows Baby Bear and Chris as they learn all about bees. And, in the third story, Abby changes the seasons with a few swishes of her wand... and everyone on Sesame Street learns a little about how all of the seasons differ. There are also a few springy songs in between the stories. Ana sat for the whole DVD (except when she got up to do a little dancing). I have to admit my favorite part of the DVD may have been the little bonus clip of Cookie Monster... I mean.... Cookie Bunny. We enjoyed watching Elmo's Rainbow... which didn't surprise me. I have yet to be disappointed by a Sesame Street DVD. It really is a great spring themed DVD. And, if you're looking for a last minute addition to the Easter basket this could be it! 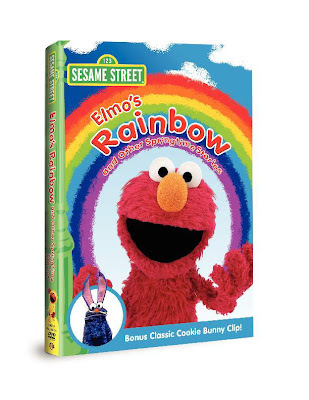 Elmo's Rainbow and Other Springtime Stories was released March 9th and is available in stores now.